My Friday afternoon was spent driving back and forth from San Francisco to the East Bay. I completely forgot that on Friday afternoons when it rains the freeways are completely insane and the traffic is worse than Paris périphérique aux heures de pointe (during rush hours). I had to drop off some food for some clients on the other side of the bridge and I thought I was never going to make it. A trip that usually takes 30 minutes, took me 2 hours. Besides I am a terrible driver, never had an accident, just a few bumper scratches but I always feel something might happen because I have no concept of space. I have no idea if the car is two meters or three meters behind me. So when I got home, I made myself a small sweet treat, to calm my adrenaline rush from all the freeway movement. I don’t know if “riz au lait” is something very popular in the US, I have never seen it served anywhere, maybe it’s considered an “unsophisticated” or rudimentary dessert, I don’t know. In France, riz au lait is something very common, that every household knows how to make. Now I like riz-au-lait with some fruit compote or caramel, or something underneath the rice. The tricky part is to keep the rice in a creamy vanilla sauce. Rice tends to absorb the liquid, then you might end up with some dry rice which is not very good. You need a lot of milk (and preferably whole milk) and let to rice simmer at very slow heat for about one hour. I used reduced fat milk and tasted great too. There are as many versions of riz au lait as there are cooks in France, so this one is just my version. You can flavor it with cinnamon if you like it. I am a vanilla fan so I don’t want to spoil the natural vanilla flavor with cinnamon. Rinse the rice under running water. Bring a water to a boil and cook rice for about 6-7 minutes. Drain. Bring milk and cream to a boil with vanilla bean split. Add rice and let it simmer at very low temperature for about one hour making sure it does not stick. After 30 minutes, add sugar and stir. Add chopped walnuts. Wash and cut strawberries, cook at medium temperature with light brown sugar until strawberries turn into a sauce. You can eat the rice lukewarm or cold. Place some strawberries at the bottom of a cup then add rice on top. Decorate with fresh strawberries and walnut bits. This entry was posted by silvia on November 6, 2009 at 11:08 pm, and is filed under Desserts. Follow any responses to this post through RSS 2.0.You can leave a response or trackback from your own site. wonderful colours!i maked last days riz au lait,but with kiwi preserves,for the breakfast.in romania is very popular,simple riz au lait,with a pinch of cinnamon. Sounds interesting & yet simple! Yeah, it’s such a terrific treat after a rush day. So, are you having tea or coffeeafter that. ha…. Have a wonderful weekend & Cheers. I wish i could eat that right now. Love the recipe and picture. I have never seen this on a menu before. I was trying to subscribe to your RSS feed and when i clicked the link I got a bunch of code. Please let me know how to fix so I can receive the RSS feeds. Congratulations with your riz au lait whoich sounds wonderful !! and if you want to play with me in the Kitchen come and see my apple swing !!! That looks delicious and sounds like something I can make with a bit of Splenda for my son. He loves Rice pudding. I am with you about driving. I am always in fear that I will knock into something. This sounds delicious and simple too. I love that. Do you simmer the rice covered or uncovered? Heard the Bay Bridge was closed for a while. That must have been nuts – adding to the usual SF traffic. I miss the Bay Area! That looks so nice and refreshing! Sorry about your stressful time – I love driving but HATE traffic. Makes me crazy and I curse at everyone! mmmmmm, so beautiful! this would definitely put me in a good mood. What a beautiful dessert! The strawberry compote sounds like the perfect accompaniment to the riz au lait. I really need this. With the traffic here in the Philippines, this is just perfect. It’s an ultimate comfort food. I’ll wait for strawberry season here. Sounds like a delicious rice pudding dish! I love this. Traffic around in Dallas is horrible – we’ve been rated one of the highest areas in the country for road rage. Great, yes? That’s enough to make me want to come home to this too! 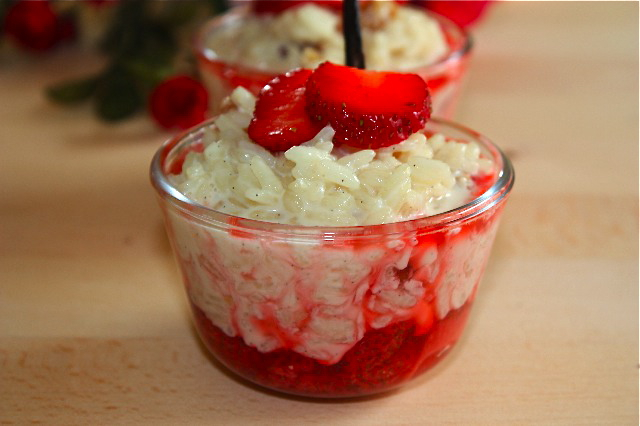 Yum — yes, creamy rice pudding is very much a comfort food here. It might be more of an East Coast thing, and the rice puddings I’ve had are more porridge-like, where the rice nearly melts away into the dessert, but its appeal is truly universal, especially after a long day.